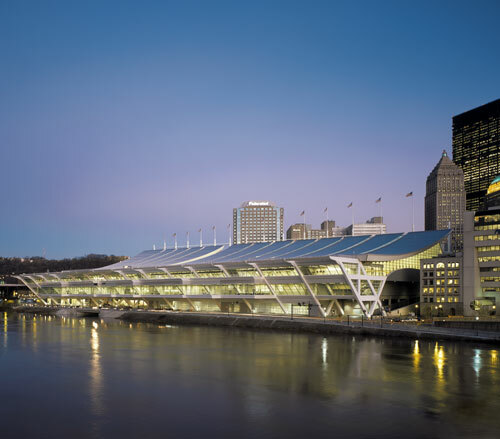 Pittsburgh's new David L. Lawrence Convention Center sits on the south shore of the Allegheny River in downtown Pittsburgh. Rafael Vinoly Architects, P.C. designed the convention center for The Sports & Exhibition Authority. 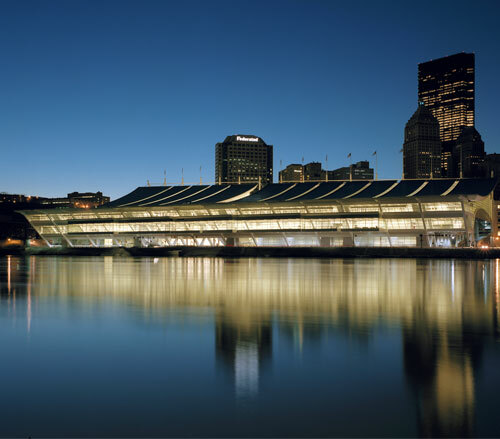 The structure is the first certified "green" convention center in the United States. 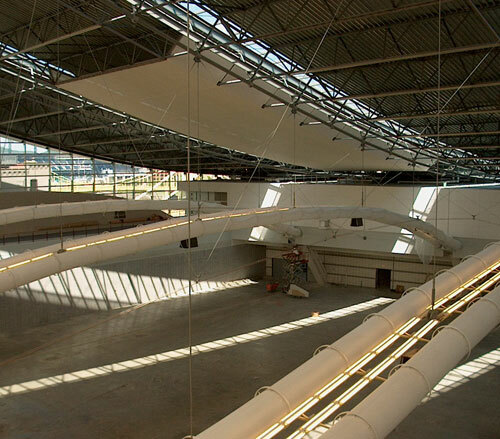 The facility has 330,000 square feet of exhibition space, of which 236,000 square feet is column-free. This view is looking towards Pittsburgh's north shore from the 2nd level "Pre-Function" area. Architecturally the new convention center has made a significant contribution to the city. The facility spans two city blocks. In contrast to Pittsburgh's skyscrapers, the convention center has a low profile. 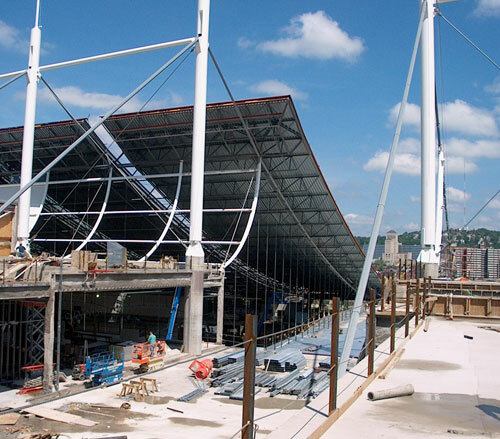 From the north, you can see its cable supported roof soars upward from the riverside. The cable roof supports are attached at their highest point by 15 masts giving the structure the grace of a great sailboat. 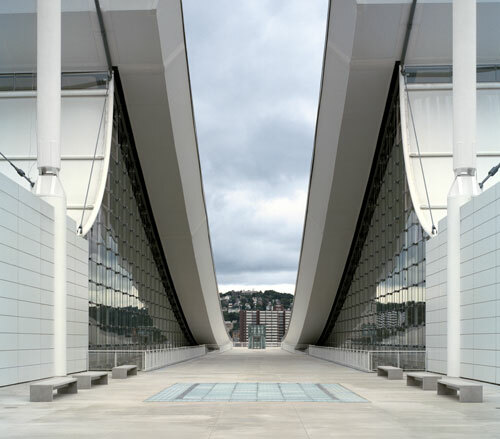 The convention center north face cantilevers out over Fort Duquesne Boulevard to the Allegheny River. 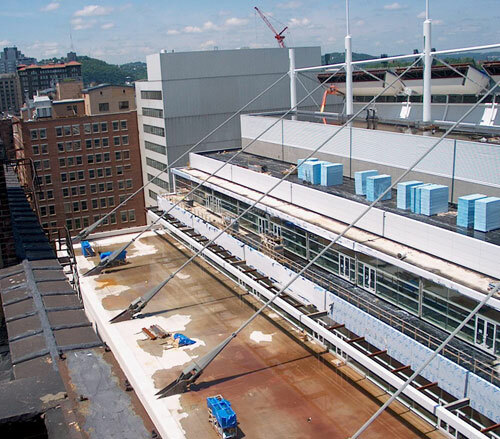 The "pre-function" and open-air terraces are located on the end of cantilever and that placement gives them a spectacular view of the Allegheny River and the renewed north shore including PNC Park. The convention center has two exhibit floors. The main exhibit area has three halls, that when combined total 236,000 square feet. The second area located on the first floor has two halls that when combined total 76,000 square feet of space. Loading docks serving the exhibition halls give exhibitors easy access to both exhibit hall floors. 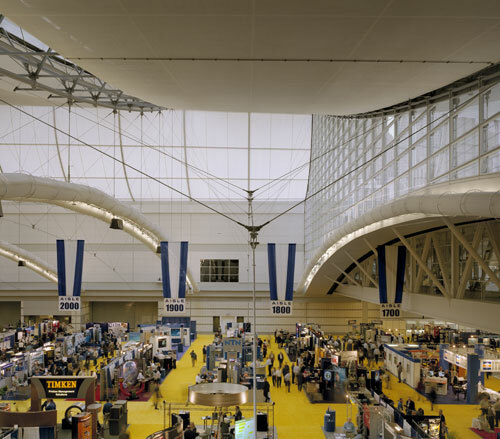 In addition to the exhibit space, the convention center boasts two-lecture halls that seat 250 people each, 51 meeting rooms, and a 33,000 sq. ft. ballroom. The photo shows the suspended ceiling with its natural light panels. Below the ceiling you can see the arched structures that supports the lighting and HVAC. In the distance through the window wall is Pittsburgh's PNC Park. View of main exhibit hall during a show. 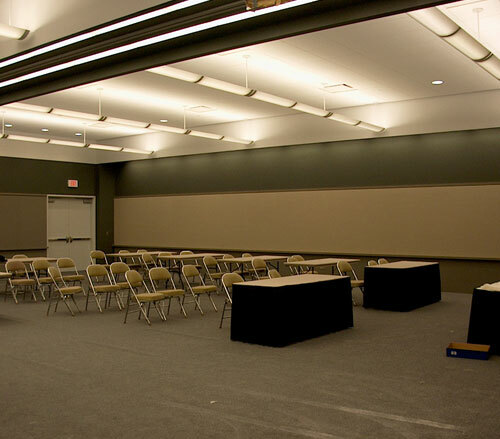 View of a typical Convention Center Meeting Room. 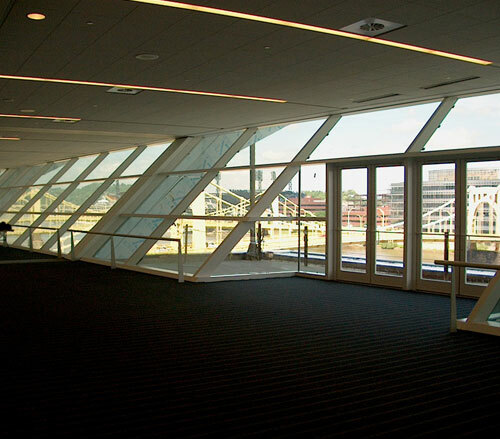 The convention center has one 5KV lineup fed by one of two-separated Duquesne Light substations or as an alternate to utility power; a generator is used for backup. The backup unit is a 1750 kW diesel generator. Three interlocked automatic transfer switches select the power source. From the 5KV lineup 4160 volts are fed to 6 main electrical rooms where the high voltage is stepped down to 480 volts. The 480 volts are then sent to 9 switchgear lineups. The 480 volt lineups distribute power to the 140 electrical panels and 8 motor controls centers.